Major equity indices in the US, developed ex-US, and emerging markets posted strong returns for the year. At the beginning of 2017, a common view among money managers and analysts was that the financial markets would not repeat their strong returns from 2016.
many cited the uncertain global economy, political turmoil in the US, implementation of brexit, conflicts in the middle east, north korea's weapons buildup, and other factors. the global equity markets defied their predictions, with major equity indices in the us, developed ex-us, and emerging markets posting strong returns for the year. The chart below offers a snapshot of the Canadian stock market based on the S&P/TSX Composite Index. 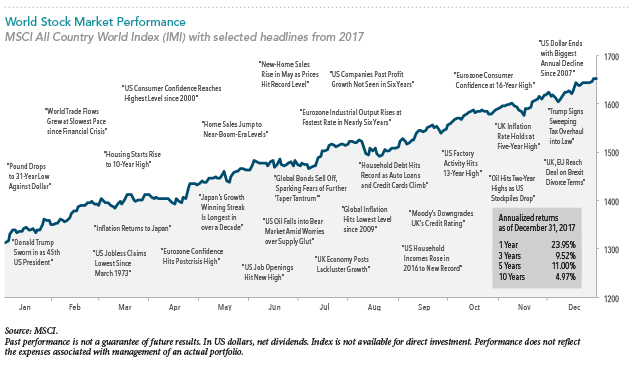 The headlines should not be viewed as determinants of the market’s direction but as examples of events that may have tested investor discipline during the year. 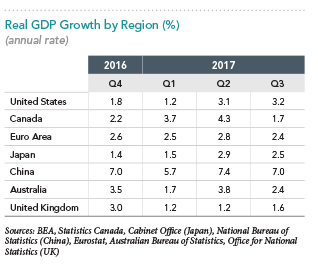 In 2017, the global economy showed signs of stronger growth, with 45 countries tracked by the Organization for Economic Cooperation and Development (OECD) all on pace to expand. Economic outlook and the expected impact on future cash flows are among the many variables markets consider when setting prices. Therefore, investors should remember that growth in the economy is not always linked to stock market performance. The Canadian equity market had a moderately positive year. The S&P/TSX Composite Index returned 9.10%. Canadian small cap stocks, as represented by the MSCI Canada Small Cap Index, returned 6.11%, and large cap value stocks, as represented by the MSCI Canada Large Cap Value Index, returned 11.63%. Returns among non-US equity markets were strong. The MSCI World ex USA Index, which reflects non-US developed markets, logged a 24.21% return and the MSCI Emerging Markets Index a 37.28% return, making this the fifth highest return in the index history. Frank Russell Company is the source and owner of the trademarks, service marks, and copyrights related to the Russell Indexes. S&P, Dow Jones, and S&P/TSX data © 2018 S&P Dow Jones Indices LLC, a division of S&P Global. All rights reserved. MSCI data © MSCI 2018, all rights reserved. ICE BofAML index data © 2018 ICE Data Indices, LLC. Bloomberg Barclays data provided by Bloomberg. Citigroup bond indices © 2018 by Citigroup. FTSE TMX Canada Bond data and Canadian One-Month T-Bills data published with the permission of FTSE. Indices are not available for direct investment; their performance does not reflect the expenses associated with the management of an actual portfolio. Wall Street Journal, “Everything Went Right for Markets in 2017—Can That Continue?”, 29 Dec. 2017.